An easy-to-wear seersucker dress for spring! Another cute project from Jessi of Sweetie Pie Bakery! We aren't lacking for April showers here in Chicago. This past Sunday we had sun, thankfully. Other than that, rainrainrain! I didn't plan well. I should have had my hair done and a pile of dresses next to me as I started out the window this week so I could have hurried outside for that window of sunshine in between all this rain. I'm just itching to get outdoors to take some pictures with green grass, flowers and sun! Until then, I have to improvise and take them indoors...poor lighting and all! As for the dress, (I suppose that is what you're here to read about!) I used the Evening Empire Dress pattern from Anna Maria Horner. This is my second attempt at this dress. The first time I used the full length, strapless version. This time, I went for option A-straps and shorter. I kept pulling up the bodice on the strapless version, afraid it would fall right off. I'm sure it wouldn't have gone anywhere, but it still made me so nervous. This version is much more comfortable to wear with the kids. I chose a seersucker for the fabric. Very summery and very child friendly. It washes up beautifully, every time no matter what they seem to get on it. I'm definitely a fan of this pattern. The bodice detail is nice and looks great with the stripe fabric, I think. Simple detail. Perfect for a summer dress. The only thing that would make it more perfect: pockets. And maybe some sunshine! Soooo cute. I love the classic blue and seersucker stripes!! Can't wait for that warm weather here in Oregon, either. 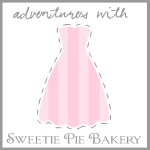 Readers, thanks for checking out Adventures with Sweetie Pie Bakery! Cool! I'm also working on a seersucker dress! I LOVE the material. I see seersucker is making a comeback. Very cute and summery. It looks good with the cardigan. I just found a bunch of amethyst seersucker in my stash - may have something to do with it finally. I love the necklace! Are you sharing a pattern for the necklace or is it purchased? Please share details on your necklace!! I'd like to see a closer pic of it.